This document presents an introduction on REST and REST with HTTP POST and GET. WSDL 2.0 HTTP Binding defines a way to implement REST (Representational State Transfer) with Web services. Axis2 implements the most defined HTTP binding specification. REST Web services are a reduced subset of the usual Web service stack. REST Web services are Synchronous and Request Response in nature. When REST Web services are accessed via GET, the service and the operations are identified based on the URL. The parameters are assumed as parameters of the Web service. In this case, the GET based REST Web services support only simple types as arguments and it should adhere to the IRI style. Axis2 can be configured as a REST Container and can be used to send and receive RESTful Web service requests and responses. REST Web services can be accessed using HTTP GET and POST. If REST is enabled, the Axis2 server will act as both a REST endpoint and a SOAP endpoint. When a message is received, if the content type is text/xml and if the SOAPAction Header is missing, then the message is treated as a RESTful Message, if not it is treated as a usual SOAP Message. On sending a message, whether the message is RESTful or not, can be decided from the client API. Set a property in the client API. There is an example named, userguide.clients.RESTClient.java found in AXIS2_HOME/samples/userguide/src/userguide/clients which demonstrates the usage of the above. It uses the "echo" operation of the userguide.example1.MyService of the AXIS2_HOME/samples/userguide/src/userguide/example1. 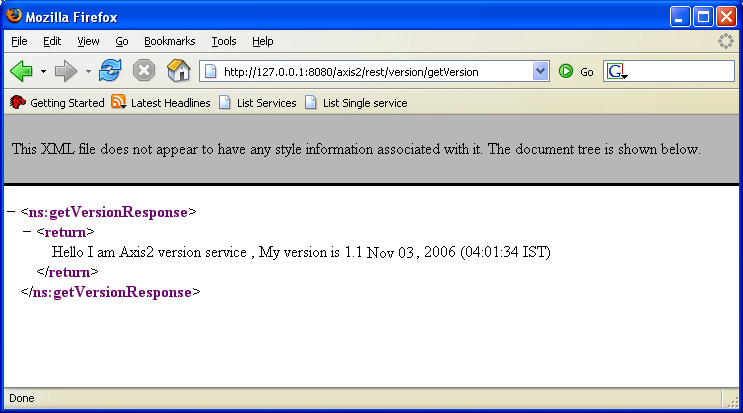 Axis2 allows users to access Web services that have simple type parameters via HTTP GET. For example, the following URL requests the Version Service via HTTP GET. However, the Web service arriving via GET assumes REST. Other parameters are converted into XML and put into the SOAP body. will be converted into the following SOAP message for processing by Axis2.